There are a handful of players out there who are constantly appearing in the finals of national tournaments, but there are very few who consistently appear in the finals of both singles and doubles. Marek Czerwinski is one of those rare junior players. 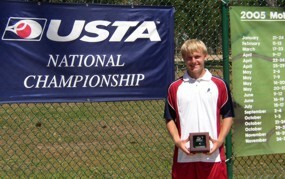 The 18 year old from Birmingham, Michigan was a finalist in both categories at the USTA National Spring Championships. It had only been a few weeks since he had appeared in the singles finals and won the doubles at the USTA National Open in Tampa and just three months since he was a singles finalist at the USTA National Winter Championships (Marek only made the doubles quarters there). Marek Czerwinski has been a fixture on the USTA national circuit as well as a handful of ITF events for the past three years. With partner Maciek Sykut he has won an astounding five national and international doubles titles and he has garnered two gold, three silver and one bronze USTA balls. Now Marek is getting ready for the next chapter of his life as he prepares to go off to Vanderbilt University next fall. I wouldn't normally interview someone who lost in two finals in two days. It wouldn't be because they wouldn't be worthy of an interview, but because I wouldn't think they'd want to talk. Marek Czerwinski is not at all like that. Tennis -- win or lose -- is his life and talking about it on any day is a natural thing for him.